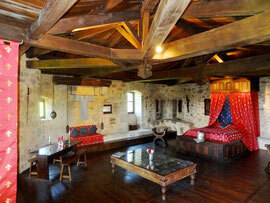 The King's Chamber - Welcome to Tennessus Castle, french medieval b&b rooms with swiming pool ! Situated at the very top of the XIV Century keep, the immense King's Chamber, with its magnificent beamed ceiling and original stone inner walkway is Tennessus' most spectacular bed and breakfast room. -. A full continental breakfast, including, cereals, croissants home made jams and fruit preserve served with a creamy yoghurt are taken in the room which has its own kitchenette in an internal turret. "La chambre Royale est tout simplement magnifique, merci pour cette nuitée magique!" Nicolas et Chantal (Avril 2018). 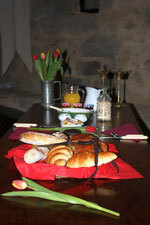 To enjoy your stay in this lovely room more fully ,order our picnic basket, to be savoured either by candlelight in your room,in the medieval potager or .....on the roof! 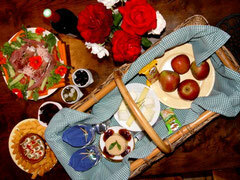 PRICE: 65€ for 2, including wine.